I haven’t lost the ability to write arbit crap. Arbit stuff going on around me off-late. We’ve had our official farewell; So we’ve officially bid goodbye to B.I.T.S - Goa. People tried their best to make the occasion appear “senti” but it seemed more like “psenti” for me. I wonder why our VC calls BITS as B.I.T.S; is it something similar to people choosing to call SAP as S.A.P? Most of the advice given was of a copy-book style. But I liked one of them, though it wasn’t expressed well enough for me - Learning from Books still remains an important way of learning, even if work teaches you a LOT. College now has its own Debian Repository hosted on a server running Hardy. Hats off to bad\sector for showing the enthu to get things done. The LUG here’s got a great bunch of people right now and its growing in leaps and bounds. I’m excited. A couple of my friends picked up Debian recently and apparently both of them are loving it thoroughly. Linux, as addictive as ever. It’s been a while since I’ve been on the winning side in carroms. Its so boring to be on the losing side for so long. So often, little things get blown out of proportion, so quickly. Or its just that not everybody sees them as ‘little’ things. On slow connections, the download ‘handler’ of firefox does really poorly. It’s next to impossible to download anything over half an MB. Our design of this introductory computer-science subject reflects two major concerns. First, we want to establish the idea that a computer language is not just a way of getting a computer to perform operations but rather that it is a novel formal medium for expressing ideas about methodology. Thus, programs must be written for people to read, and only incidentally for machines to execute. Second, we believe that the essential material to be addressed by a subject at this level is not the syntax of particular programming-language constructs, nor clever algorithms for computing particular functions efficiently, nor even the mathematical analysis of algorithms and the foundations of computing, but rather the techniques used to control the intellectual complexity of large software systems. I would like to see a few courses developed on similar lines here. Gmail themes are good. I only tried the “Terminal” theme, though. I loved it! Just got the news of more Violence in Mumbai; What the hell do these people want? I end this post here. 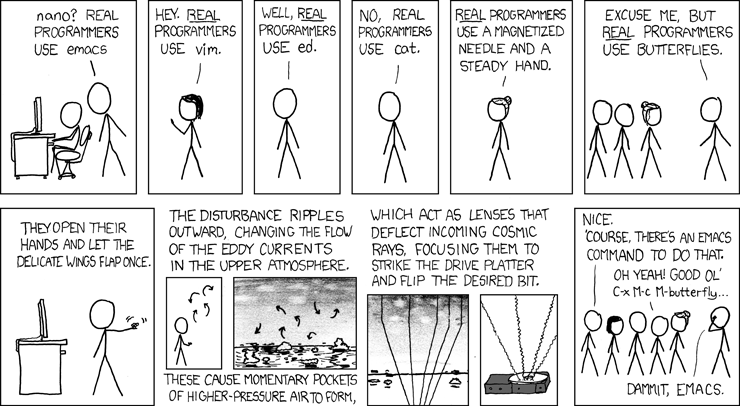 Here’s an xkcd strip I liked.